Retail Execution The way brilliant in-store execution is meant to be done. Deliver the right data to the right people at the right time Retail execution is essentially about getting the right product to the right place at the right time and defining several specific goals using achievable quantitative measurements. We can talk about Retail Execution in terms of competitive intelligence gathering, digital merchandising, image recognition and superior execution at the retail shelf. Trade-marketing managers, merchandisers, supervisors, sales managers, sales reps, all these peoples can be implied in the process of creating perfect stores and increase sales with brilliant retail execution. 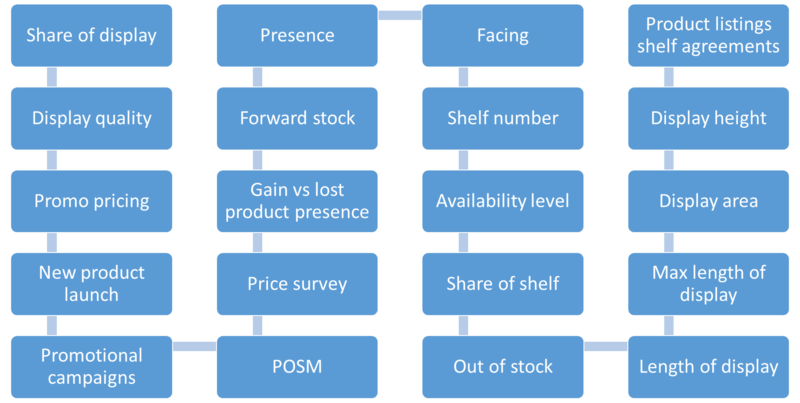 Presence: avoid out-of-stock situations, numerical distribution, share-of-shelf (SoS) etc. Positioning: shelf standard and product location, competition etc. Promotions: POSM, Promoted SKU, seasonal campaigns, secondary displays etc. Competition: new product alert, price survey, promotions, secondary displays etc. Planogram: facing compliance, SoS compliance, product sequence compliance, heatmap etc. Price: price tag compliance, promotional prices, competitive benchmark, packages pricing etc.